Swampland in West Milford, New Jersey. Image a creature that could break down environmental toxin, cleaning our water better than we ever have done before. A research team at Princeton reported their discovery of exactly that – a bacteria that provides a more efficient method for treating toxins found in swage, fertilizer runoff, and other forms of water pollution on April 11, 2018 in PLOS ONE journal. The bacteria, Acidimicrobiaceae bacterium A6, can break down ammonium anaerobically, or without oxygen. This is a hug breakthrough as an alternative method to the costly oxygen-dependent methods currently used in sewage treatment. Waste water treatment plants benefit heavily from this discovery, as many of them discharge into watersheds and must remove ammonium beforehand. Doing so has always requires churning copious amounts of oxygen into the waste to feed the bacteria that carries out the process. Most bacterium use oxygen in a chemical reaction that turns ammonium into nitrite, which is then converted into benign nitrogen gas by another type of bacteria. Before conducting their experiment, the authors of the study hypothesized that A6 performs the Feammox reaction instead, a chemical reaction that breaks down ammonium, taking place in wetland environments such as the riparian wetlands and New Jersey. Scientist previously were unsure of what enabled this reaction to occur, but after conducting a study in 2015, they found that the Feammox reaction only took place in swamp samples where Actinobacteria were present. 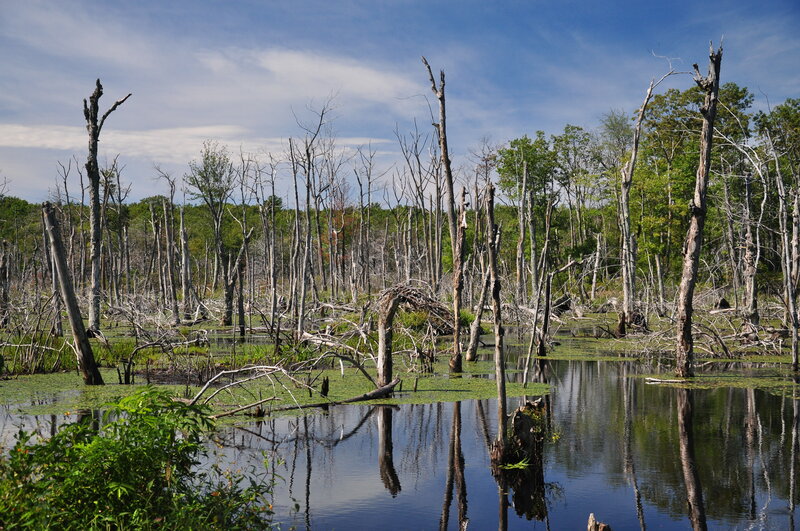 In the study most recently published by the researchers at Princeton, mixtures of soil samples and metal mediums were placed in an oxygen-free environment to mimic wetland soil where the bacteria originated. After checking samples every two weeks over a year, the scientists discovered a sample of soil where ammonium degradation took place. They identified that A6 was the bacteria carrying out the Feammox reaction through genetic sequencing. Researchers emphasized the potential to treat other environmental pollutants found in oxygen-poor areas, such as underground aquifers. A6’s ability to remove environmental toxins from waste opens up the doors for ensuring clean water in a variety of situations, from sewage treatment to cleaning up contaminated wells. The research team hopes to explore how to build a reactor where the A6 bacteria can be used on an industrial scale to process ammonium. In fact, they are in the works of building a prototype reactor with the Chinese environmental ministry. Besides oxidizing ammonium, A6 can also remove two common pollutants that are hard to treat called trichloroethylene and tetrachloroethylene. This discovery has the potential to address a range of environmental problems as ammonium has dire effects on the environment if not removed for water sources. Once in waterways, ammonium can cause of a depletion of oxygen as well as eutrophication, an excessive growth of algae. Both have detrimental effects to watershed ecosystems, from streams to rivers to oceans. Taking advantage of bacteria A6 could save not only ecosystems and environmental health, but protect human health as well. When you think of air pollution, you might think of smog or automobile emissions, but think again. Scientists at the Cooperative Institute for Research in Environmental Science at the University of Colorado, Boulder and NOAA have recently published in Science in February 2018 detailing their findings that petroleum-based chemicals used in items like perfumes, soaps, deodorants, and paints emit as much volatile organic compounds (VOC) as motor vehicles. VOCs interact with particles in the air that then develop into smog primarily in the form of ozone, which can trigger asthma as well as scar lung tissue. They can also develop into a type of pollution called PM2.5 that has been linked to heart attacks, strokes, and lung cancer. 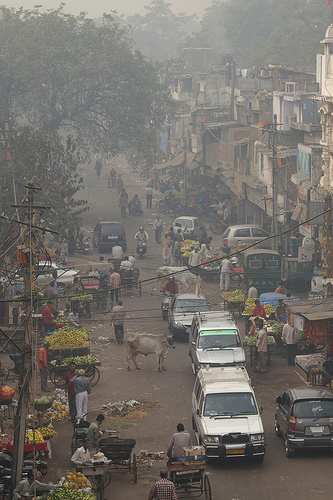 After regulations were developed in the 1970s to limit VOC emissions from automobiles, commodities like pesticides and personal care products became increasing cause of air pollution. The stricter regulations on car emissions made it more obvious than ever to scientists that household and personal products were a bigger threat to air quality. The study was influenced from past measurements collected of VOCs in California, which had shown higher concentrations of petroleum-based compounds at higher levels than initially predicted from fossil fuel sources alone. Researchers realized that even though drivers use far more fuel (by weight) than they do personal or household products, gasoline is “stored in an airtight tank, it’s burned for energy, and converted mostly to carbon dioxide,” said Jessica B. Gilman, who was involved in the study. Since carbon dioxide emissions are not smog-forming VOCs, it does not contribute to air pollution as much as a spray or squirt of a petroleum-based product, most of which ends up in the atmosphere. For their calculations, the authors of the study created a computer model that simulated air quality in Los Angeles by using data from the chemical composition of tailpipe emissions consumer goods. Based off these calculations, they found that roughly half of the VOCs in the air could be attributed to consumer products. These findings have huge implications for human health, especially because most consumer products are used indoors. The traditional approaches to mitigate air pollution are not enough because they commonly focus on transportation or industrial sources. The regulations need to be extended to consumer products as well to mitigate their effects on environmental and human health. If you want to do more to decrease your impact on air pollution, “natural” products aren’t necessarily the answer, as many chemicals used in these products are incredibly reactive and well still form VOCs. The best option is to use as little household product as you can when you need to. McDonald, B. b., de Gouw, J. A., Gilman, J. B., Jathar, S. H., Akherati, A., Cappa, C. D., & … Trainer, M. (2018). Volatile chemical products emerging as largest petrochemical source of urban organic emissions. Science, 359(6377), 760-764. Can Frogs Tell us how to Avoid Extinction? Think the black plague, but worse. It’s called the chytrid fungus disease, and you don’t have to worry about it unless you’re a frog or salamander. While the black plague killed about 30 to 50 percent of the worldwide human population, the chytrid fungus has been able to wipe off whole amphibian populations off the map. Researchers at the Smithsonian Tropical Research Institute (STRI) in Panama have published their study, Shifts in Disease Dynamics in a Tropical Amphibian Assemblage are not due to Pathogen Attenuation, in the March 30 edition of Science detailing the results of this epidemic and its implications for disease-related extinction. 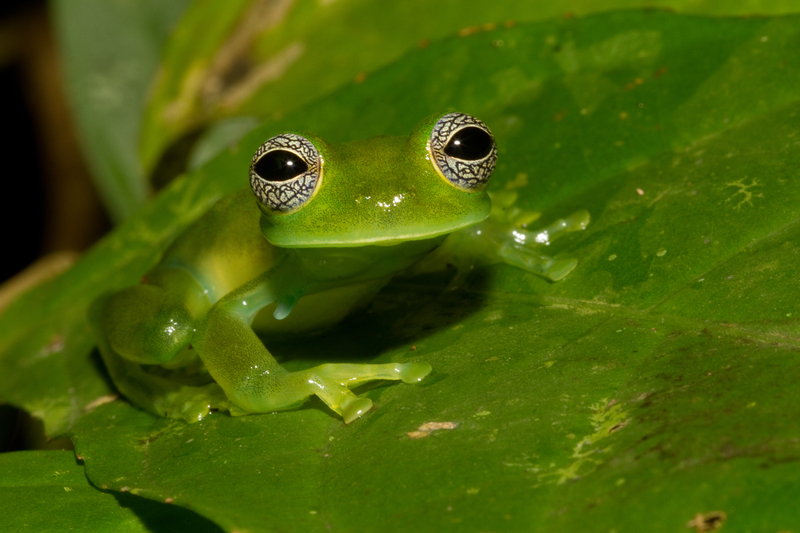 The researchers were lucky as they saw the epidemic coming from Costa Rica to Panama, and were able to study the amphibians and the disease during and after its peak. Researchers were able to examine the various interactions hosts had with the pathogen because they collected host samples and pathogen from before, during, and after the epidemic occurred. They specifically tract infection patterns and virulence, species numbers and communities, and their resistance to the pathogen. Recovery of nine amphibian species between five and 13 years was observed even though the fungus, Batrachochytrium dendrobatidis, was still present. After noticing that the skin secretion of wild frogs inhibited fungus growth remarkably more than the secretion from frogs moved into captivity before the disease arrived, researchers hypothesized that the wild frogs became more resistant to the disease. Think of the notion that kids should eat dirt to build up their immune system. If an organism is never exposed to various environmental elements, their body will never learn how to resist them, making it extremely difficult to combat disease. Roberto Ibáñez, a STRI staff scientist and in-country director of the Panama Amphibian Rescue and Conservation Project said, It is vital to understand how disease transitions work — from outbreak, to epidemic, to coexistence — and our results have implications for a skyrocketing human population facing emerging diseases with the potential to cause global pandemics.” The results of this study and others relating to highly virulent disease systems suggest that some disease dynamics may be primarily driven by host factors – such as the ability of the organism to develop pathogen resistance or genetic variation – specifically when infectious agents remain highly pathogenic (disease causing). These findings have expanded our understanding of the spatiotemporal changes in host-pathogen interactions. 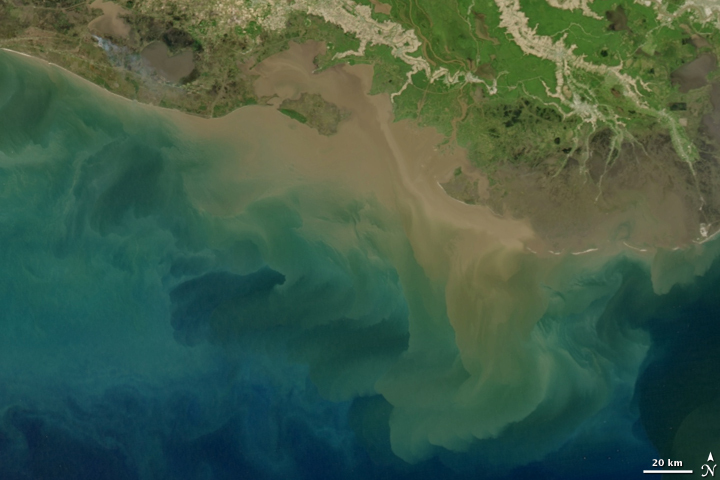 Sediment-laden water pours into the northern Gulf of Mexico from the Atchafalaya River in an image taken by the Moderate Resolution Imaging Spectroradiometer (MODIS) on NASA’s Aqua satellite on April 7, 2009. Researchers at University of Waterloo published a study in Science in late March of 2018 giving new insight into the fact that restoring the water quality in the Gulf of Mexico is harder than originally thought. The Gulf of Mexico contains a hypoxic or dead zone, an area found in bodies of water that have extremely low levels of oxygen due to excessive nutrient pollution from human activities. Recently, attempts have been made to reduce the size of the Gulf’s dead zone, but despite these investments of large amounts of money, researchers have concluded that the legacy of nitrogen is so intense that these goals are unrealistic. This dead zone is due to large quantities of nitrogen being carried through rivers and streams across the North American corn belt to the Gulf. Massive algal blooms sparked by the concentration of nitrogen leads to oxygen depletion, making it more difficult for marine life to survive. Due to its continual expansion, this area is approximately the size of New Jersey, and will continue to grow unless drastic measures are taken. Major changes in agricultural and river management practices must be made in order to see any type of improvement of water quality. Researchers compiled and analyzed more than two centuries of agricultural data, showing that nitrogen has been accumulating in soil and groundwater due to intensive agricultural production. The water quality of the Gulf of Mexico has been declining since the 1950’s. It’s hypoxic zone is mainly caused by use of fertilizer and intensive livestock production. Manure and fertilizer are both rich in nitrogen, and can easily enter watersheds through runoff. The need for intensive agricultural production is only increasing, nitrogen quantities will continue to rise do to this, creating a massive problem for marine life around the globe. Effective policy must be implemented to curb the growth of this massive dead zone in the Gulf of Mexico, which imposes a great risk on marine ecosystems all over the region. Crop Field: Using crops to transfer carbon dioxide into the soil has been found to be an unrealistic option. It was once a groundbreaking idea that that climate change mitigation was plausible by burying carbon in the ground. However, in late February of 2018 scientists at Rothamsted Research published their findings in the journal Global Change Biology that soil data stretching back to the mid 19th century demonstrates that carbon emissions cannot be stored in the ground. The researchers concluded this by analyzing of the rate of change in carbon levels in soil. The original idea of using crops to collect carbon from the atmosphere and burying it in the soil was proposed in 2015 at an international conference. The aim of this proposal was to increase carbon sequestration (the removal of carbon dioxide from the atmosphere and holding it solid or liquid form) by “4 parts per 1000.” The researchers at Rothamsted insisted that this rate was unrealistic for such large areas all over the planet, stating that levels of soil carbon are not unrestricted; as the levels increase, they move towards equilibrium and eventually stop growing. Data from 16 experiments on three different soil types were examined, giving 110 treatment comparisons. The researchers observed the “4 per 1000” rate of growth in soil carbon levels in some cases, but only when such extreme measures were taken that they would be impractical in a real-life setting. Not only did these experiments prove the impracticality of the “4 per 1000” initiative, but also displayed that high rates of soil carbon increase can be achieved by removing land from agriculture. However, this extreme decrease in agriculture over vast expanses of land would be incredibly damaging to global food security. To mitigate this problem, researchers have suggested returning residue from crops to soil as an effective solution to increase carbon soil sequestration; this has been observed as an practical method used by some countries in smallholder agriculture settings. The researchers also suggested that long-term crop rotation with occasional introduction of pasture could lead to significant soil carbon increases. While the environmental benefits are clear, this method is economically impractical for most farmers. In order for an effective change in agricultural methods to be plausible, there would have to be implementation of new policy or guidelines. Overall, the “4 per 1000” initiative is unrealistic as a major contribution to climate change mitigation. The scientists at Rothamsted Research suggest that there has to be more logical reasoning for promoting practices that increase soil carbon levels is more important to ensure sustainable food security and wider ecosystem services. Forest ecosystems are a large carbon sink because of their ability to absorb carbon dioxide from the atmosphere. They play a huge role in the mitigation of climate change, but the impacts of deforestation has cause the Earth’s surface to heat up. Researchers at the European Commission Joint Research Centre published an article in February of 2018 in the journal Nature Connections detailing how recent changes to the vegetation that covers the earth is causing it to heat up. They examined the effects of cutting down vast expanses of evergreen forests for agricultural expansion on energy imbalances that contribute to the rise in local surface temperatures and global warming overall. 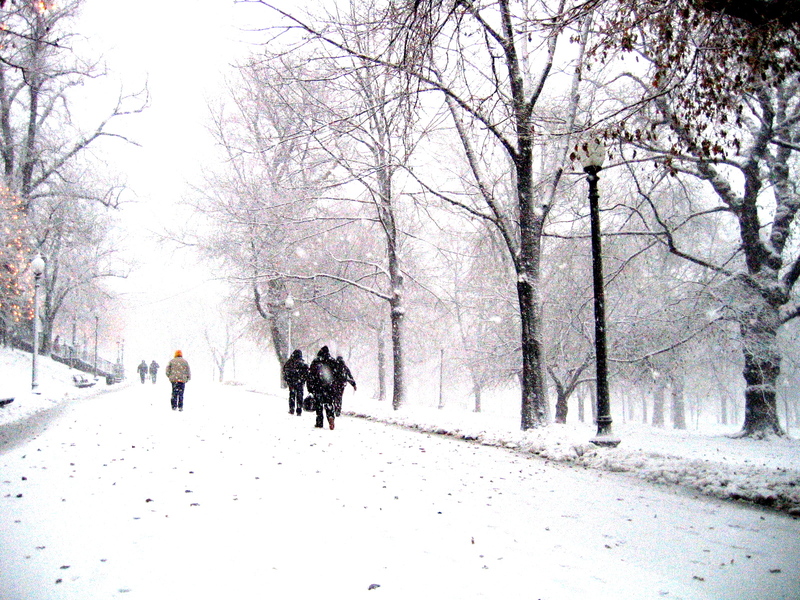 These actions have alter radiative and non-radiative properties of the surface. 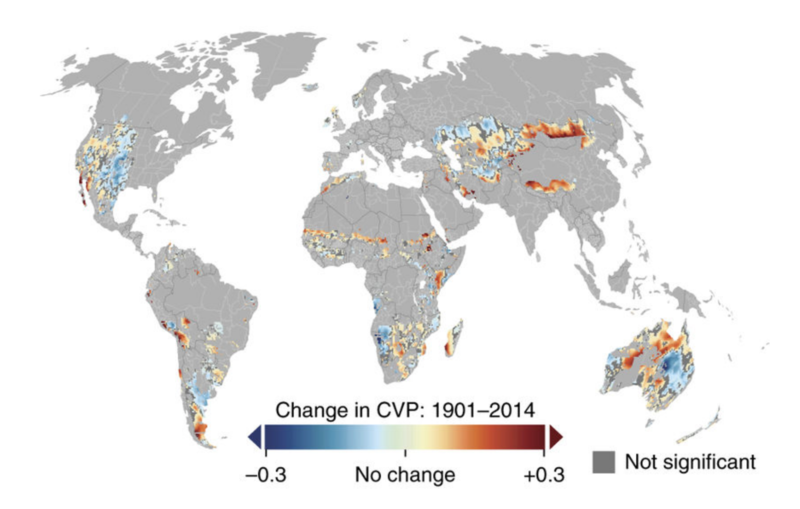 Using satellite data, the researchers analyzed changes in vegetation cover from 2000 to 2015 all over the world and linked them to changes in the surface energy balance. The statistical relationship between maps of vegetation cover and variables detailing surface properties acquired by satellite imaging was then analyzed. The researchers also examined changes between different types of vegetation, including evergreen broadleaf forests, deciduous broadleaf forest, evergreen needle leaf forests, savannas, shrublands, grasslands, croplands, and wetlands. 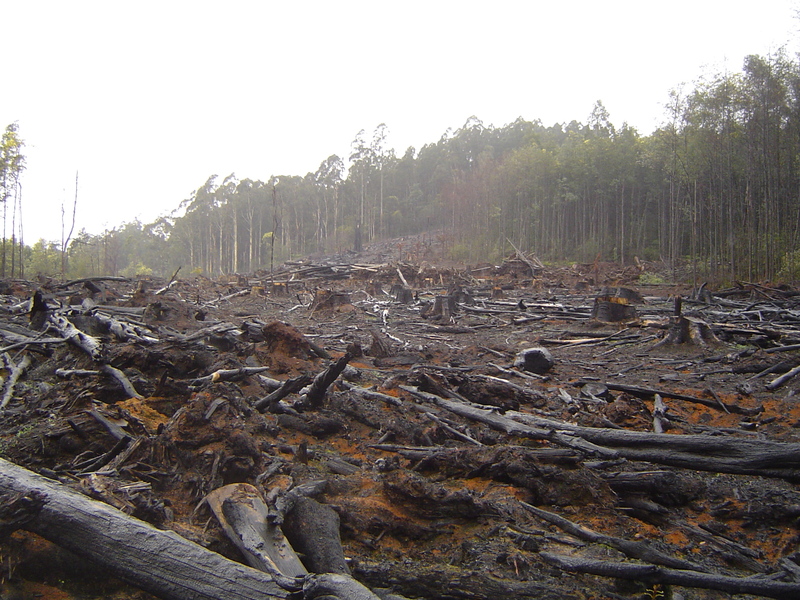 While deforestation results in overall higher levels of radiation leaving Earth’s surface, the balance between the shortwave light the sun emits and the longwave energy the reflects changes depending on forest type. From their observations, researchers concluded that removing tropical evergreen forest for agricultural expansion is the most responsible for an increase in surface temperature locally. Altering the vegetation cover changes its surface properties drastically, affecting an increase in the level of heat dissipated by water evaporation and the levels of radiation reflected back into space. Overall, the researchers determined that land use change has made the planet warmer. Clearly, these forest ecosystems play an important role in combating the effects of air pollution, soil erosion, and overall climate change. In February 2018, researchers at the University of Minnesota published a study in Nature Climate Change showing how precipitation variability has increased significantly on 49% of the world’s grazing lands. This variation in precipitation can have detrimental effects not only on the environment as a whole but also on the livelihoods of those who rely on livestock that graze on natural vegetation for food security. Using climate data from 1901 to 2014, the researchers studied precipitation variability trends and concluded that grazing lands experienced an overall increase in fluctuation, both within and between the years. They also related global satellite measures of vegetation greenness to climate factors to reveal that variation in precipitation is a significant controlling factor of global vegetation productivity. Not only this but in their observations, researchers found that areas with high variation of precipitation support lower livestock densities than less-variable regions. This map shows the changes in between-year variability. Of the total land area considered pasture in this analysis, 20% did not experience significant changes (in gray), while 31% experienced significant decreases, and 49% experienced significant increases in precipitation variability. With this information researchers were able to assess the risks to places where livestock grazing is important to local food security by using global data sets for percent pasture area and market influence to “define areas in which livestock grazing may play a more or less important role in local food availability or the economy.” These findings exhibit how grazing is extremely vulnerable to the potential effects of climate change, which may put the millions of people dependent on livestock for food security at risk. The researchers concluded that changes in precipitation variability may cause a change in the composition of certain ecosystems and may also threaten the maintenance or expansion of livestock production. 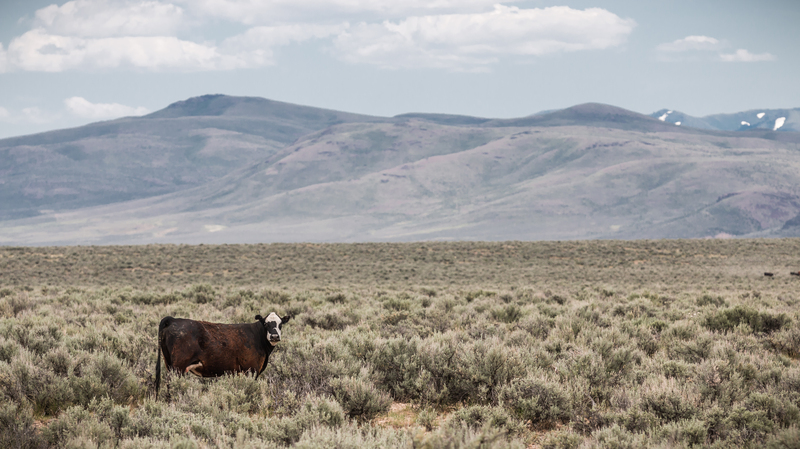 However, the impacts of climate change on livestock grazing will not only depend on precipitation variation but also on region, long-term precipitation trends, changes in the timing of snowmelt, the magnitude of precipitation events, and the changes in seasons. With global grazing lands experiencing 25% more year-to-year variability in precipitation than the average global surface land area, the impacts of climate change on these regions could be detrimental to both the livelihoods of humans and the environment overall. Water is essential to maintaining all life on earth, yet two billion people worldwide don’t have access to a clean or safe water. However, availability of fresh water may change as seen in an article published on the 9th of February, 2018 in Sciences Advances. This article, titled “Ultrafast selective transport of alkali metal ions in metal organic frameworks with subnanometer pores” details the findings of researchers at both Monash University and the University of Texas at Austin that offers a breakthrough solution to the water crisis. They discovered that metal-organic frameworks (MOFs), a material with the largest internal surface area of any known substance, can be used to capture and remove salt and metal ions from water. Metal-organic frameworks are sponge-like crystals that can capture, store, are release chemical compounds. MOFs have a narrow distribution of pore size, making them useful in various separation technologies as well as for the storage of gases like hydrogen and carbon dioxide. MOFs have been used in gas purification and separation, as a catalyst (something that increases the rate of a chemical reaction), or as sensors. The researchers discovered that MOFs can mimic the filtering function or ‘ion selectivity’ of organic cell membrane. They are able to remove salt from seawater and separate metal ions in a highly efficient and cost effective manner. The researchers estimate that MOFs can improve desalination capacity in water treatment processes by a factor of 2 to 3 in energy consumption. This means there is a more cost-effective, fast way to treat water and make it readily available for those who need it most. Not only this, but MOFs are able to extract metals that are harmful to humans and otherwise difficult to remove from drinking water. For example, since lithium-ion batteries have become the most popular battery for mobile electronic devices like phones and tablets, they are in such high demand that unconventional methods may have to be developed to continue lithium production, such as extraction from water with metal-organic frameworks. 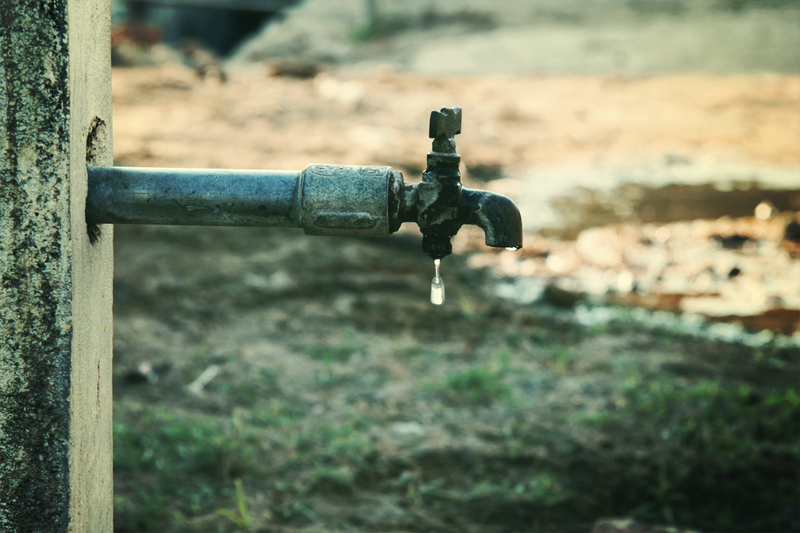 There are both economic and physical reasons a region could be effected by water scarcity, but the results are the same; humans without the basic necessities of life. It can be caused by lack of investment in technology and infrastructure to collect water from various sources, economic competition for water quantity and quality, or simply the irreversible depletion of drinkable groundwater. The increasing world population, expansion of irrigated agriculture, improving living standards, and changing consumption patterns will only make it more difficult to obtain clean and safe drinking water for all, so these findings published by researchers at Monash University and University of Texas at Austin bring big news to the table in terms of providing the essentials for life to humans worldwide. While it was previously thought that just large concentrations of carbon dioxide and methane were trapped within the permafrost of the Northern Hemisphere, researchers with the American Geophysical Union have recently discovered that this permafrost also contains the largest reservoir of mercury on the planet. Published on February 5th, 2018 in the journal Geophysical Research Letters, the study details their discovery that permafrost in the Northern Hemisphere contains an enormous amount of mercury; a finding that has extremely negative implications for the health of not only humans but ecosystems all over the world. Permafrost, the permanently frozen soil that occurs in locations with high latitudes, makes up 24% of the land in the Northern Hemisphere and supports various ecosystems. 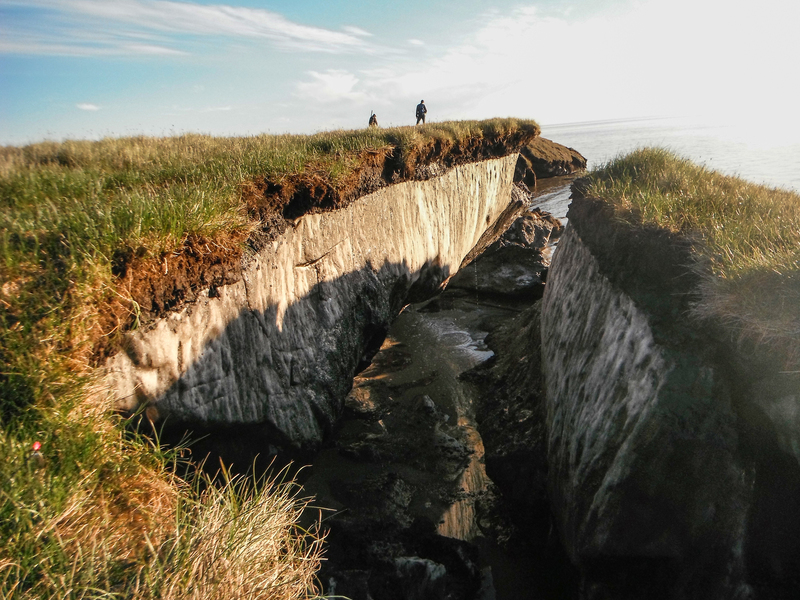 As a result of climate change, permafrost in the Northern Hemisphere is at risk of melting. Model projections that assume anthropogenic greenhouse gas emissions continue at their current rate estimate a 30-99% reduction of the Northern Hemisphere’s permafrost by 2100. If this occurs, not only will the structural integrity and ecosystems of permafrost regions be at risk, but massive amounts of carbon dioxide, methane, and mercury will be released, harming ecosystems all over the world. Mercury specifically can accumulate in the food chains of both aquatic and terrestrial networks, harming the reproductive and neurological systems of animals. This study, which took place between 2004 and 2012, had 13 sampling sites across Alaska that represented a variety of characteristics and ages typical of permafrost soils. After analysis in the U.S. Geological Survey (USGS) Research Laboratory in Boulder, Colorado, researchers found that their measurements were consistent with published data on mercury in both samples of permafrost and non-permafrost soils from thousands of other sites worldwide. With these observations they calculated the total amount of mercury stored in permafrost in the Northern Hemisphere and created a map of mercury concentrations in the region. Based on these observations and calculations, the researchers deduced that the Northern Hemisphere permafrost region contains nearly twice as much mercury as all other soils, the ocean, and the atmosphere combined. 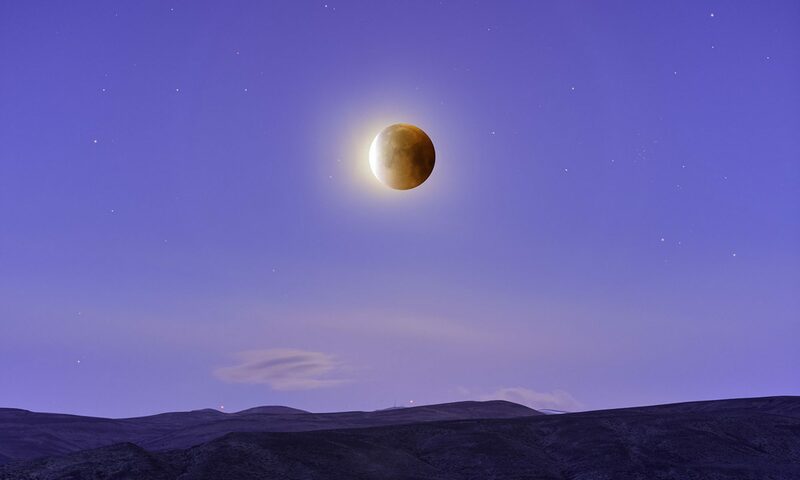 They concluded that there is a need to reevaluate the role of the Arctic region in the global mercury cycle. Climate change impacts everything around us, from weather to the land, air, and water itself. Due to the rise of carbon dioxide in the atmosphere, ocean acidification levels are rising, which in turn threatens the health and wellbeing of coral reef ecosystems. A study was recently published on how ocean acidification directly affects the health of coral reefs, which are essential for protecting coastlines, providing a habitat for aquatic life, and assisting in the chemical conversions of carbon and nitrogen fixing that are essential for life on earth. 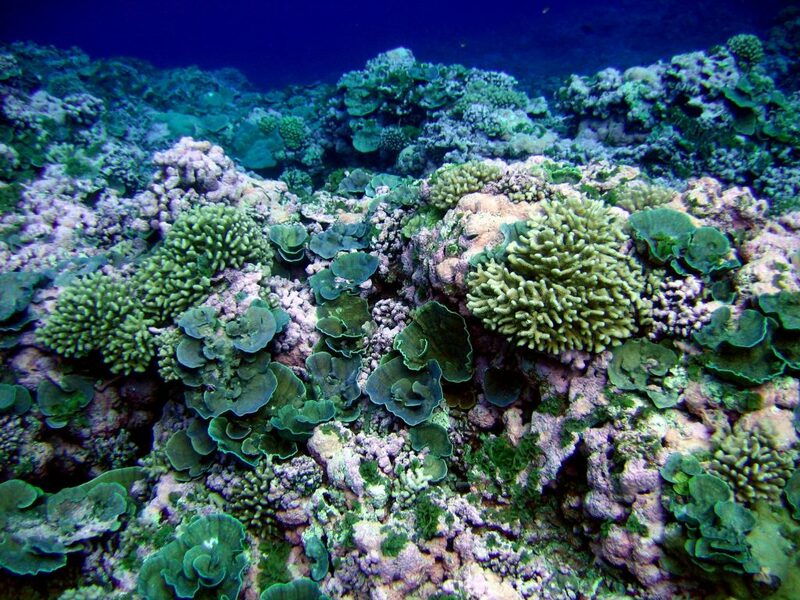 A research team at Woods Hole Oceanographic Institute in Massachusetts published a study on January 28, 2018 that identifies the specific way various coral species is affected by ocean acidification and display the effects of future environment conditions on reefs. They determined that ocean acidification hinders growth of coral skeleton in the thickening process, which in turn reduces the skeleton’s density and leaves it more vulnerable to breakage. While it had been theorized that coral calcification rates decline as ocean acidification increases, these predictions hadn’t been consistent in a laboratory setting or when studying corals inhabiting reefs with low pH levels. The WHOI was able to study coral skeletons and determine how pH levels and carbonate ion concentrations effect coral reefs and create a mathematical model that predicts how skeletal density will be effected by climate change and ocean acidification in the 21st century. This research plays an important role in examining the impact we have on the world around us and how human actions will effect ecosystem’s future health. The team took core skeletal samples of Porites, a common coral, from four locations all over the world where sea water conditions vary in pH level and carbonate ion concentrations. Using a 3-D computerized tomography scanner to image the cores, the researchers found annual growth bands on the skeletons (similar to the growth rings of trees) that imply the skeletons of coral in more acidic environments were significantly thinner. After developing a numerical model that modeled the growth mechanism of coral skeletons and comparing it to projected changes in ocean acidity caused by climate change, the researchers concluded that declines in coral skeletal density will occur in coral reefs all over the world. The Indo-Pacific region in particular will be greatly impacted; it has been predicted that there will be up to 20% in reductions in skeletal density by 2100. This in turn will affect the overall health of coral and the ecosystems coral provides for a vast array of marine life. Ocean acidification does not happen in isolation and other environmental effects caused by climate change will inevitably also affect the health of these important ecosystems.